A portion of salmon, a handful of green beans, a dollop of good-quality pesto and a little squeeze of lemon juice are all you need for this dish. And all of these gets wrapped in a foil! It was fun making this dish as I had friends over for dinner and I had help making this. As long as the salmon is fresh and of good quality, you can’t go wrong with this dish. The pesto and lemon gives it a good seasoning base. I find that the advantage of pesto and lemon is that these are ingredients that do not replace the original taste of the main ingredient, in this case the salmon. You are still able to taste the original sweetness of the fish. Should you use tomatoes or stronger herbs such as rosemary, they tend to replace the original taste of the main ingredients. Preheat oven to 200 degrees. Trim your beans by cutting off the stalk ends but leave the wispy tips on. Half one of the lemons. Get yourself about a yard of aluminium foil and fold it in half to give you 2 layers. Put a handful of green beans in the middle of the aluminium foil. Lay a salmon fillet, skin side down, across the beans and spoon over a good tablespoon of green pesto. Drizzle with olive oil, squeeze over the juice from one of the lemon halves, and season with salt and pepper. Pull the aluminium foil edges together and scrunch them up to seal the parcel. 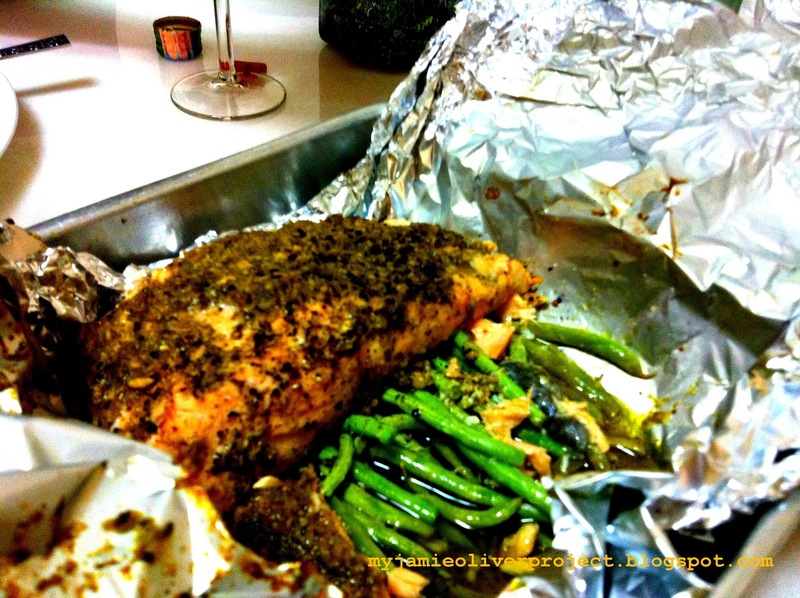 Repeat these steps to make your second salmon fillet parcel and place both foil parcels on a sheet pan. Put the sheet pan into your hot oven and cook for 15 min. Remove the pan from the oven and let it stand for a minute before carefully unwrapping and checking if the salmon is cooked through. Nicely served with lemon wedges and baby potatoes.